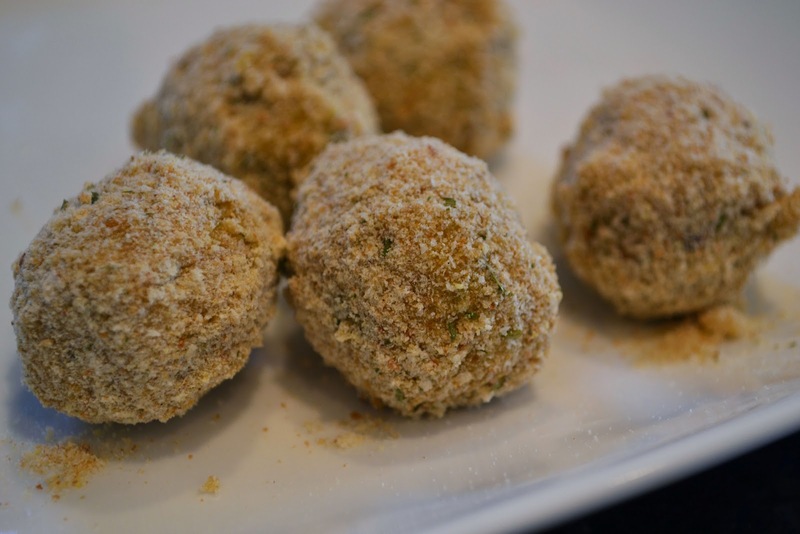 Olive ascolane are deliciously stuffed green olives which are breaded and fried. They are originally from the Le Marche region of Italy. Thankfully, they are widely found all over Italy, and are easily made at home. In Italy, I would mostly enjoy them as an appetizer at a pizzeria. Olive ascolane are a great crowd pleasing appetizer. All the work can be done ahead of time, so they can just be quickly dropped in the fryer when you're ready to eat and enjoy. While the ideal olive to use for this recipe is the original from Ascoli, they are not available where I live. I have found success with this recipe using other kinds of green olive. I usually try to find a jar of nice, large, green olives. The ones I find are usually from Spain. If they have a pit, of course you need to pit them. I usually end up buying the ones that are stuffed with pimiento peppers, and then I just easily take those out, and the olive has a nice cavity ready to fill. To make the filling, first make a soffritto, by finely chopping the carrot, onion, celery and onion in a mixer. 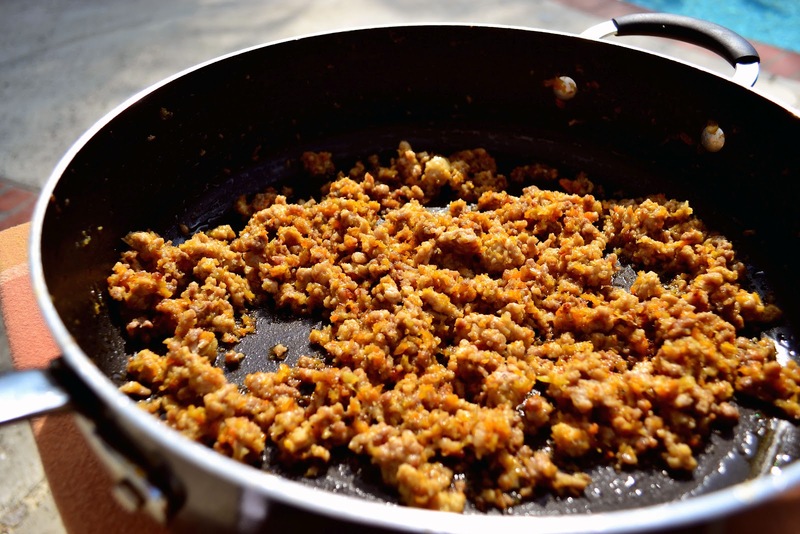 Saute the mixture in extra virgin olive oil over medium high heat in a large skillet until it is soft. Then add the ground beef, pork, and chicken. When the meat is browned, add salt to taste, then add the 1/2 cup of white wine. Stir often over medium heat until the wine has been absorbed. At this point remove the meat mixture from the heat and let it cool. Once the meat mixture has cooled, put it in your mixer and pulse it until it becomes homogeneous. Then put it in a mixing bowl, and add the egg, parmigiano reggiano cheese, and the two pieces of bread that you have crumbled into pieces. Stir the ingredients until they are thoroughly combined, and then leave it rest for about 30 minutes. Get your olives ready to be stuffed. Remove pits, or any peppers, etc. the olive may have had. 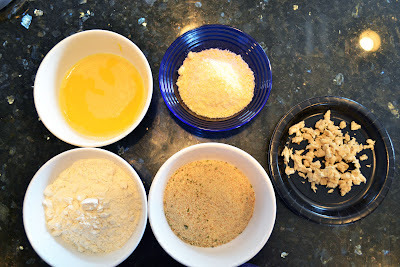 Prepare three small bowls to coat them first flour, then eggs, then bread crumbs. Start with two eggs, and beat them with a whisk. You may need to put more egg later, depending on how many olives you are making. Fill each olive with as much filling as you can fit inside of it, I find a demi spoon and fingers work best. Dip each stuffed olive first in the flour, then in the egg, and finally a generous coating of the bread crumbs. After all of the olives have been coated in bread crumbs, let them rest for about 30 minutes. Then, I recommend giving each olive another egg and bread crumb coating. This will make them extra crunchy and tasty. If you are short on time, you can just do the one coating, but it's better to do them both. Finally, heat your oil in the fryer until it is nice and hot, about 360 degrees. Drop the olives in the oil in small batches, and fry them for about 2-3 minutes, until they have a nice uniform golden brown color. When they are done, remove them and set them in a dish lined with a paper towel to absorb any excess oil. Serve them hot, and be amazed how quickly they will disappear as your guests enjoy them. 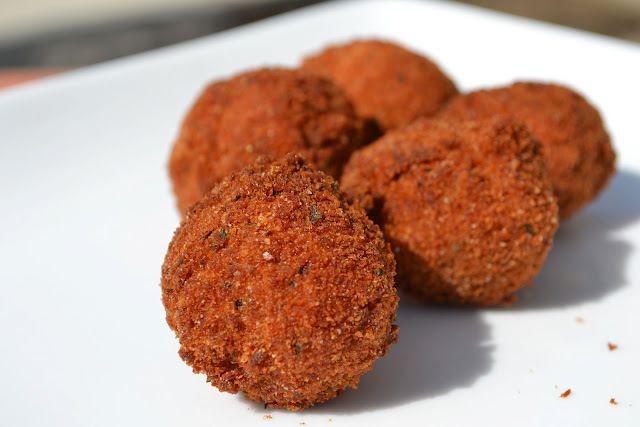 They are really versatile, and taste great with beer, wine, or any other favorite beverage.